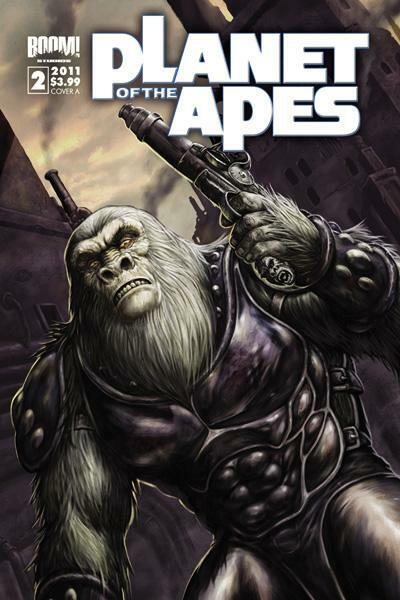 Apes #1 — Cigars, everybody! So what’s the gestational period for an ape? It can’t be long, because an entire planet of ’em took about five months, from script brainstorm to publication date. The official date for Planet of the Apes #1 is now set at April 27, 2011, and there’s a five-page preview (as well as a few covers) at http://robot6.comicbookresources.com/2011/04/preview-planet-of-the-apes-1/ Take a look at how that Carlos Magno draws apes! I’ve been doing a bunch of interviews, as a forum chat, a podcast at Wordballoon (not out yet), and a few minutes with Sohaib at Fictional Frontiers (not out yet either — I’ll post a link when they’re up) . Oh, and to skip ahead, here’s the cover for #2.